Originally published on philly.com August 19, 2016 by Jane M. Von Bergen, Staff Writer. Two days after Linda Roehner graduated from high school, she started at Hatboro Federal Savings as a teller. 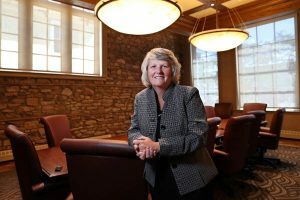 What’s it like to be the president of a bank where you started as a teller? It’s rewarding. It’s nice to know that the board saw my hard work and achievements and rewarded me. It must be inspirational to the tellers. We try to advance people from the tellers. My IT person, my bookkeepers, everybody in processing and loan servicing – they were all tellers first. We’re invested in our employees. Does it change your relationship with your staff, given your background? With the benefit of me being a teller, doing loan servicing, doing whatever, I am knowledgeable of every facet. I’m probably in the trenches too much. Your bank is tiny in a consolidating sector. We’re here and we’re here to stay. That’s our motto. We don’t want to merge with other banks like everybody else does. We have this little niche and I think we do it really well. We’re a real community bank. We’re the bank that basically helps people get their first home and teaches the kid, ‘Here’s your first little passbook. We’re one of the only banks in the area that still has passbook savings for a little kid coming in and doing his savings. For a kid, we would do a $5 passbook account. We would do anything to help the kid and encourage him to learn how to save. How do you compete against the larger banks? Hatboro Federal does not have fees. We don’t fee our customers. When you come in, we have friendly tellers that will say, ‘How are you? How’s your granddaughter? How was her birthday party?’ People still want that interaction. You see more older people in our lobbies, but they’re not dead yet. We like our seniors coming in. We have cookies and free newspapers and we have hot dog days in the summer. What about young people? Given their college debt, can they even buy houses? Your bank makes most of its money from mortgages. Our first-time home buyer program is great. We put in a mortgage rate at 3.5 percent, with no fees. We did $17 million over two years in it, which is good for our bank. We’ll take that first-time home buyer and sit down and explain the process of buying a home and what everything means. At this point, we’re trying to let the Realtors know that Hatboro Federal is back in the market. Back in the market? What do you mean? For many years, we were not in the market. Not only did we lose customers, but we lost those Realtor relationships. Back in 2008, when mortgage rates plummeted, we purposely didn’t move our rates down. So you lost business as people refinanced their mortgages elsewhere. Yes. Everybody thought the economy would have recovered much quicker than it did. So, in that little time period, if we had lowered our rates, we would have been earning less money and we would have been stuck with those mortgages for 30 years. We don’t sell our mortgages. We want to service our customers. If you have an issue, you call our branch and a person answers. I would say within the last six months, we’re priced competitively. In hindsight, we probably should have lowered rates back then. But your first-time home buyer mortgages are at a low rate. Aren’t you stuck with them? The first-time home buyer doesn’t typically stay in their home for 30 years. They will move and the mortgage will re-price as the market goes up. Any tips on saving for that first down payment? Interview questions and answers have been edited for space.